Memo to Philips. How can you let a CD called The Art of the Toy Piano go out of print ? It is one of the most surprising records I own. 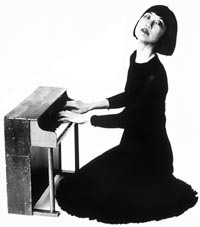 On it Margaret Leng Tan plays pieces like the Moonlight Sonata, Eleanor Rigby and a whizz-bang version of the Star Spangled Banner as well as other compositions made especially for toy piano. Here she is playing the toy piano as well as some other toy instruments.